The leverage this tool provides to move the rear control arm makes it easy to accurately adjust toe on most Saturn vehicles. The newer LH vehicles use a knurled sleeve with a slot in it, threaded to the outer tie rod and inner tie rod to adjust toe. Often the sleeve is hard to turn because of corrosion on the threads. Conventional toe-adjusting tools can damage the original sleeve. This tool will help prevent damage to the sleeves and inner bushings while making adjusting the toe easier and quicker. This economical tool fits most cars and light trucks with split tie rod sleeves. Double-end feature makes 360 degree turns possible. limited access. Fits most standard size and compact passenger cars and light trucks. This kit includes part numbers 71959 through 71999. It will allow adjustment of most cars and light trucks and also includes the two larger adjusting tools needed for the new Ford Super Duty pickups. Tools have a 1/2” drive opening that allows the use of a ratchet or breaker bar. Kit comes with a protective carrying case. 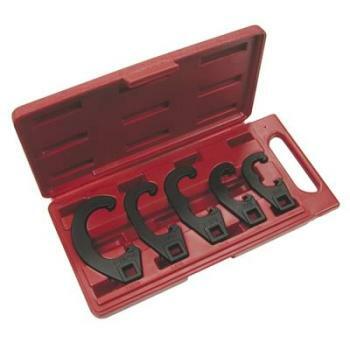 These tie rod tools spread the tie rod adjusting sleeve for easier adjustment. You can use these tools with a breaker bar for additional power. With 1/2” drives. Power Grip Jaws outperform pliers, channel locks, pipe wrenches and visetype tools. Full 360° rotating/self adjusting ratcheting head operates at any angle on pipes, fittings, bolts and nuts of all kinds. This tool is one of the best tools to adjust toe on Hondas, Nissans and Toyotas, along with other vehicles that use a knurled grip for adjustment. Perfect for rusted and frozen bolts as well as “rounded” off heads. May also be used for tie rod adjusters. Tool allows quick, precise, and profitable adjustments of rear toe on both left and right sides of GM “W” body vehicles. This tool is specifically designed for use on the Ford Super Duty trucks as well as most other light trucks and vans as well. The extra long bar gives you maximum leverage to loosen rusted sleeves without injuring your knuckles. This 8 position tool allows 360° rotation without removing the adjuster block from the sleeve. When changing GM inner tie rod ends, the technician must “crimp” the new tie rod onto the rack. This tool makes the job easy and locks the tie rod end on the rack without requiring excessive force on the rack seals. This 1/2” drive tie rod tool will allow the easy removal of tie rod ends on most cars and light trucks. The U-shaped slot measures 1” x 3/4”. Set includes the 89105 Dual Socket Inner Tie Rod Removal Tool along with the 89106, 89107 and 89108 adapter sockets. Also available individually. Removes tie rod ends with a straight, fast, firm pull. Makes installation of the 87330 camber/toe kit easier. It has a 2-1/4” reach and a 2-1/2” spread. Also for pressing bushings from control and trailing arms.